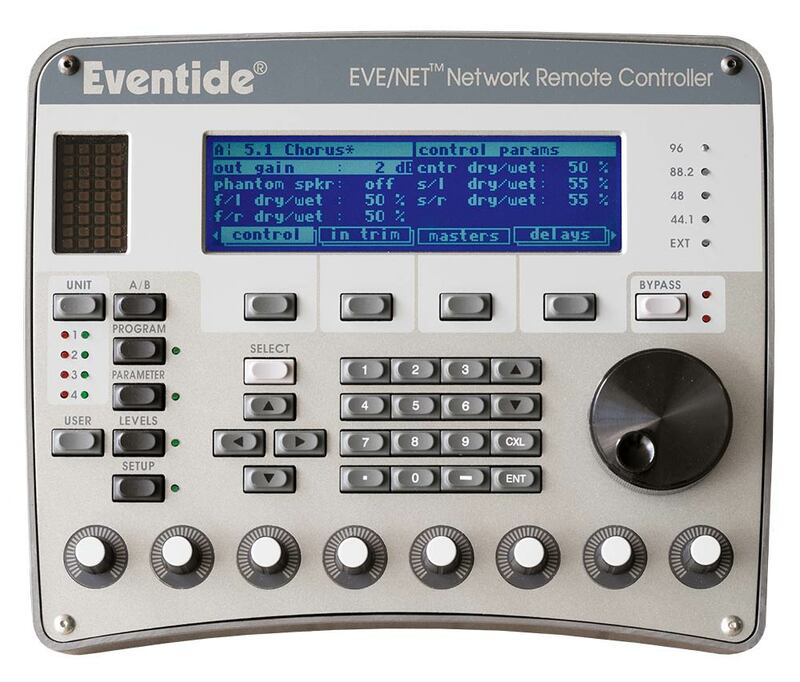 The Eventide Orville is a programmable, multichannel, multipurpose, dual digital signal processor (DSP), 24 bit digital audio signal processor with UltraShifter capability. That’s a lot of adjectives! It is the successor to a long, proud line of digital signal processors that stretches back to a time when most audio manufacturers didn’t know digital audio from Morse code. Eventide Orville is loaded with features that put it in a class by itself. It has four analog inputs, four analog outputs, four digital inputs, and four digital outputs that can all be used simultaneously. Routing among them is completely flexible (“anything to anything”)! What’s more, Eventide Orville houses two independent signal processors, each having four inputs and four outputs (imaginatively dubbed “DSP A” and “DSP B”). The two processors can be run in parallel, in series, or in any mutant variation thereof. Most frequency and time-dependent parameters (e.g. delays, LFO’s) synchronize to a system tempo for ease of use. And if that’s not enough, DSP A boasts nearly three minutes of sample time in addition to the 40 seconds of delay time found on both DSP A and DSP B! And for the user who is interested in making his or her own programs (if the huge number of factory programs aren’t enough! ), Eventide Orville continues the “modular programming paradigm” that made the DSP4000 famous. Programs are composed of individual building blocks, or “modules,” that allow the user to create original programs. Inspiration and creativity are given no bounds. . .
Eventide Orville is loaded with features that put it in a class by itself. Routing among them is completely flexible (“anything to anything”)! What’s more, Eventide Orville houses two independent signal processors, each having four inputs and four outputs (imaginatively dubbed “DSP A” and “DSP B”). The two processors can be run in parallel, in series, or in any mutant variation thereof. Most frequency and time-dependent parameters (e.g. delays, LFO’s) synchronize to a system tempo for ease of use. And if that’s not enough, DSP A boasts nearly three minutes of sample time in addition to the 40 seconds of delay time found on both DSP A and DSP B! And for the user who is interested in making his or her own programs (if the huge number of factory programs aren’t enough! ), Orville continues the “modular programming paradigm” that made the DSP4000 famous. Also available as a headless version, which requires the remote function.